One of the biggest challenges when working with bolted joints is achieving a precise, accurate preload. Inadequate preload is a common cause for bolted joint failure, which is why it’s so important to use the appropriate bolt tightening methods. In this blog post, we’ll look at some of the most common bolt tightening methods and their advantages and drawbacks. Once a bolt is tightened, the shank experiences both direct and torsional stress, which needs to be taken into account when calculating total stress and its relation to yield. The prevailing industry wisdom is total stress should be 90 percent of yield. 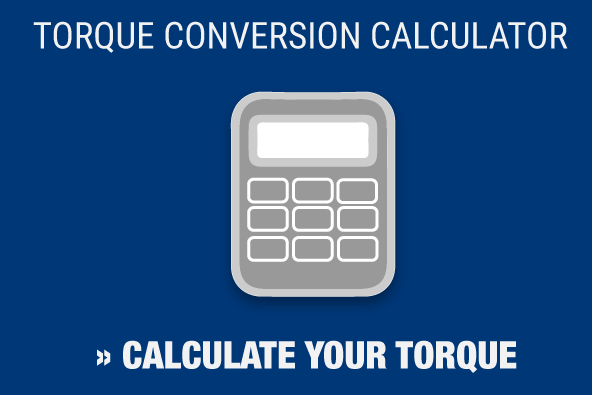 A major drawback of using this method: small changes in frictional conditions can lead to more significant shifts in bolt preload, as most of the torque in play is used to counter friction. Friction stabilizers can diminish this effect, and using flanged nuts and bolts can help improve accuracy. Also known as the “turn of nut” method, angle control was first introduced in the years after World War II for applications requiring a certain tightening angle. It’s a method that’s been used with power wrenches, where the bolt is tightened to a preset angle past the elastic range, leading to a small difference in preload due in part to the yield stress tolerance. One disadvantage of this method is determining the precise angle, which should be done through experimentation. 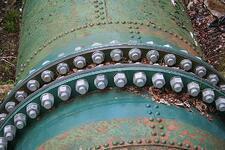 Note that fasteners can only withstand a few reapplications before they wear out. This technique can lead to highly accurate preload by keeping friction and scatter to a minimum. 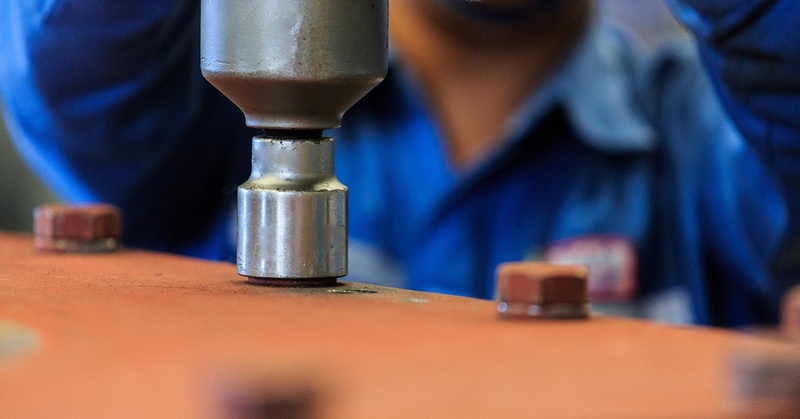 This method takes its inspiration from the “sense of feel” an operator would have when using a wrench, giving them a precise sense of the fastener’s yield point. This method replicates that feel. As the bolt is tightened, the torque wrench senses a change in slope and halts tightening as the yield point is reached. One downside to using this method is the cost of the tools, as a wrench with the control circuitry needed is more costly than conventional wrenches. This method is used to tighten bolts that have diameters greater than 20 mm, as these bolts need an extremely high tightening torque. 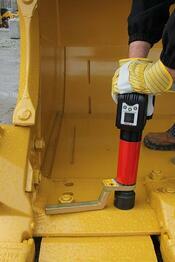 This method employs a hydraulic ram placed over the nut and a threaded puller which attaches to the ram. 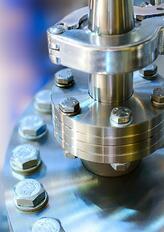 The threaded section of the bolt should extend past the nut for this method to succeed. This is perhaps the least commonly used of the bolt tightening methods on our list, and typically only used for extremely large bolts. Heat tightening uses the thermal expansion characteristics of a bolt, heating the bolt with a direct flame, sheathed heating coil or carbon resistance elements to make it expand. From there the nut is marked using the angle of turn approach, and the system gets time to cool down. As the bolt tries to contract, the clamped material constricts it to create a preload. The drawback here is the length of the bolt, which becomes difficult to measure, as the system needs to return to ambient temperature for each measurement. This bolt tightening method involves measuring bolt tension through things such as load indicating bolts and washers, along with techniques that calculate the length change of fasteners. Bolt tensioning methods require reliable tools, which is something Maxpro has provided to a range of different industries for more than 25 years. We are the world’s leading supplier of RAD torque wrenches, and can boast an A2LA-accredited calibration lab, where we test every tool we sell, rent or repair. We also carry bolt tension calibration instruments to certify all bolts, wrenches tensioners and other tools. Contact us today to find out how we can assist you in your next project.